How to Start a Blog (on the Side) in 2019 - Blog Smarter, Make Money! For the past ten years I've been starting successful blogs from scratch and running them with the most cutting edge technologies in the industry. I study digital media marketing techniques and develop systems and processes that guarantee success. I created this site to give beginners an novices the resources they need to plan, design, launch, and market a successful website. So, you are interested in learning how to start a blog? Well, you’re in the right place! You’ve stumbled upon the best resource available for new bloggers. I promise this site provides all the tools needed to get you on the path to success with your blog. I’m going to walk you through step-by-step how to get your blog platform installed. 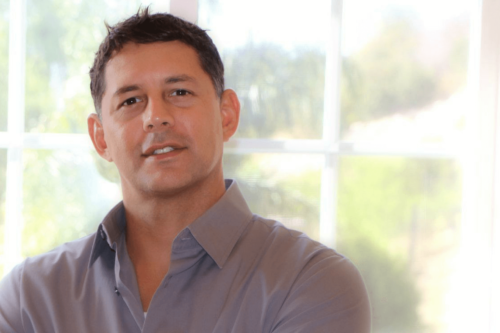 I also offer a FREE 6-Day Blog Profit Mini Course that's perfect for beginners. In the email course I'll take you step-by-step through my 20-part video series teaching you how to use your blog software to design your website. Next, you'll learn how to find a profitable niche and finally you'll discover how to turn your blog into a profit generating machine. Hey! My name is Mike Brown, I created TheBloggingBuddha.com, and I’m here to guide you to Blogging Nirvana! In fact, if you follow along, by the end of this quick tutorial your website will already be up and running. Out of a passion for writing. Are you interested in sharing a journal of your experiences with the world? A blog diary is a perfect platform to connect with like-minded people. Build a profitable blog and work from home. Making money online is a tremendous reason to create a blog. Many people make a full-time income from blogging, it’s hard work but extremely rewarding. Advertise business or professional services. There is no better marketing tool available that will drive more traffic and sales than a blog site. Local business see their traffic and revenue skyrocket after building a website online. It’s exciting and super easy! One of the best things about building a site is how much fun it is. WordPress (a blog platform which I’ll teach you about soon) makes it super easy for anyone to start a website or blog. More than 74.6 million people use WordPress so you can’t go wrong with this blog platform. Everything you’ll need to build a successful blog is on this page, right now! Short on time right now? No worries! Sign up for the 6-Day Blog Profit Mini-Course for FREE. Discover the "secrets" used by top bloggers - On YOUR time. Yes, you can even earn a living by blogging. I know, because I’ve been doing it for a few years now. When I started blogging, I had absolutely no experience, skills or audience whatsoever so what are we waiting for? let’s get started! These are the primary sections I’m going to cover. You should have your blog created in about 20 minutes. Without a clear subject and goal in mind, your blog will become a mess of incoherent thoughts and irrelevant content. Therefore, choosing a topic to blog about should come before any other step. Your subject will determine everything from your domain name and content to your audience and monetization method. Do you want to start a fashion blog? How about an eCommerce store? Secret: I use WordPress hosting for my blogging platform for under $5/mo. If you already have an idea of what your blog will be about – great! Feel free to skip this section and move on to Step 2. For those of you who are still unsure, grab a piece of paper and a pen. Meditate on these four questions, and write down your answers in bullet form. Include as many points for each item as you like. What are you passionate about or interested in? 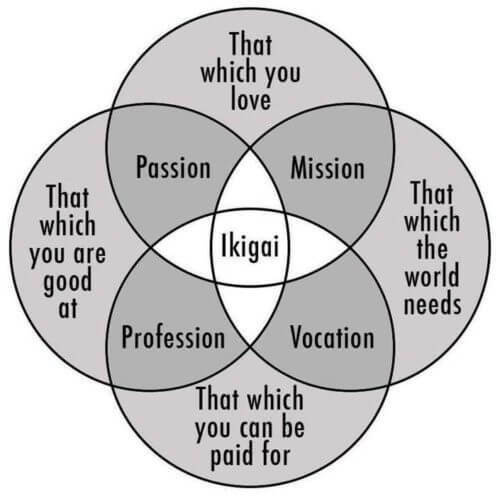 What are you good at or knowledgeable about? What do you think the world needs? What could you make a profit from? Having a profitable blog comes down to one thing…finding the right niche. Finding the right niche can be a challenge, luckily I’m here to help. Keep reading! While it’s not mandatory that your blog idea meets all 4 of these criteria, you will definitely find at least one blog-worthy topic from answering these questions. When I began my first blog, I had a deep passion for anything techy: gaming, software, hardware, everything. My interest in this niche also meant that I had tons of knowledge about it – information, advice, and opinions that I could share with the world. This passion, knowledge, and demand made the topic easy for me to create a blog around. When these three elements come together, monetization happens organically. Do you want to learn how to create a blog for free and make money? In general, there are two types of blog platforms “free” and self-hosted. Keep reading to understand how you can make money blogging and if you can do it on a “free” blogging platform. Free Blog Platforms: Involves a long, unprofessional URL, no control and no profits (the so-called “free” blog platforms). 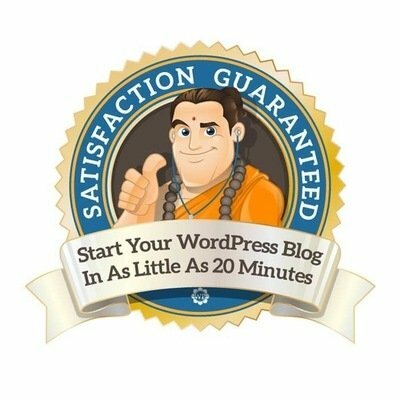 Self-Hosted WordPress (Recommended): Also known as WordPress.org and you can make money blogging. Novice bloggers who take the free route get sucked in by the promise of a “free” blog. However, many people don’t realize that these free blogging platforms exist to make money off of your free blog (not just because they like you). They do this by selling you “upgrades” and more importantly, selling your ad space (and keeping every penny). No Profits. Ever! You can forget about monetizing your website through advertisements (a bloggers main source of revenue in most cases). Not only that, but you will have no control over what advertisements are shown on your website. Many free blogging sites prohibit you from selling your own products and services as well. ProTip: Self-hosted WordPress is the superior method for building a blog. There are certainly other blogging platforms besides Tumblr and Blogger. I have nothing against the other platforms but in my opinion nothing compares to the flexibility, customization options, and freedom that WordPress (self-hosted) allows for. Zero control: Since you don’t actually own your blog, you have little control over what happens to it. If the hosting site decides that your content goes against their Terms of Service (which change frequently), your entire website could be deleted without warning. Lack of security: Sometimes sites get hacked, and that’s just the reality of the internet. However, if this happens to you while you’re using a free blogging host, you can easily lose your domain name and your entire site. Unappealing domain name: Free blog platforms like Tumblr force you to have a subdomain. All professional, successful websites have their own domain names, not subdomains. With all of that said, free blogs do have their merits, or else they wouldn’t still be kicking around. If a free blog is the right path for you, check out my step-by-step guide on setting up a “free” account here. The far superior option is going with a self-hosted WordPress blog on a domain you own. 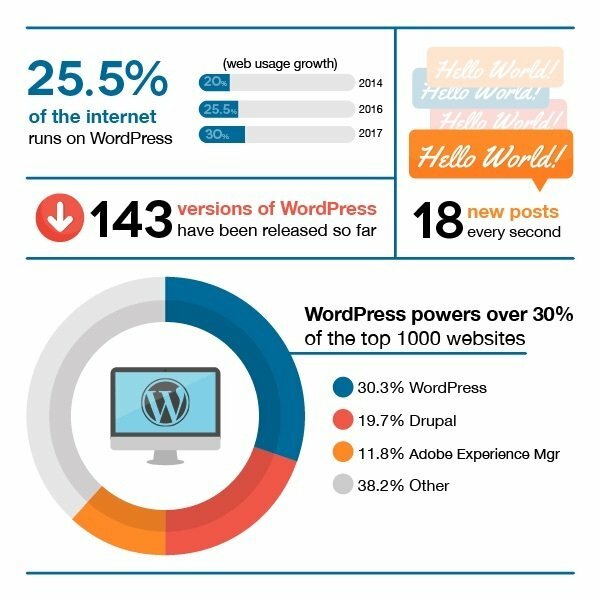 The majority of blogs you see online are hosted on self-hosted WordPress websites. In fact, this blogging platform is so popular that it’s raked in more than 72 million downloads and comprises over 48% of the top 100 websites on the internet. Considering there are now over 1 billion websites on the internet. That’s huge! Moreover upward of 52% of new domains in the U.S are being run on WordPress. WordPress is open source software, which means it’s free and open for developers to contribute to. This is also great for you because it gives you tons of options for plugins (add-ons), themes, and a way to completely customize your blog. I’m excited to share this blog platform with you, and I’m going to support you the entire way through creating your blog, customizing your blog, monetizing your blog, to getting your blog site to show up on Google. Special Bonus: I've secured you a FREE domain plus 47% off website hosting. 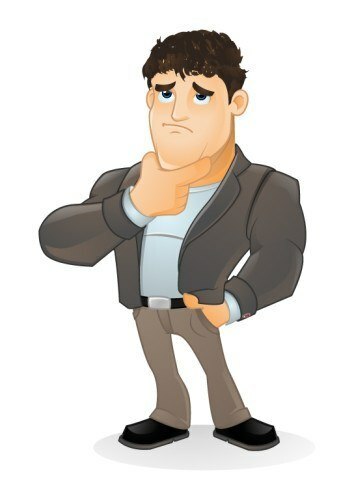 In this section I’ll go over how to pick a website name and web hosting company. To enjoy all the benefits of having a self-hosted blog one thing is necessary… a reliable Web host. As part of a special “Thank You” to my readers, and because I’m a long time customer, I’ve secured a FREE domain name to any person who follows this guide on how to make a blog. I have also negotiated 47% OFF on web hosting for your blog (the hosting plan is under $5.00/month). I recommend www.InMotionHosting.com for domain names and self-hosting WordPress. To snag the least expensive plan available click the button and just follow the screenshots and instructions I’ve provided, below. I recommend you choose the Launch plan , as you can see you are getting over 40% off the hosting plus Free Setup. You get a free domain when you start a blog with InMotion Hosting. If you are still not sure about hosting your site with InMotion I recommend you read my comprehensive InMotion Hosting Review. 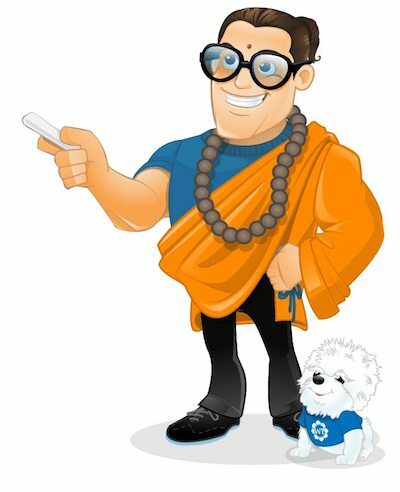 A domain name is simply your website’s address, like TheBloggingBuddha.com for example. Though it seems like a small step, choosing the right domain name for your blog is incredibly important. 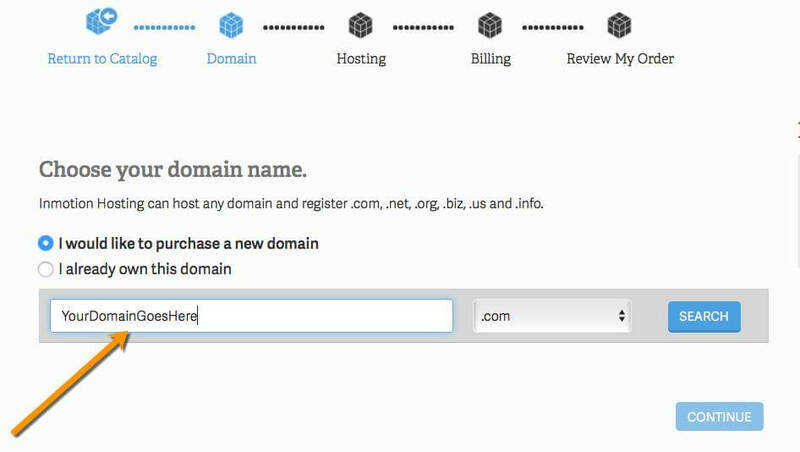 If your domain is available add it to the cart and select Continue. Check to see if the name is available on social media sites like Facebook, Twitter, and Instagram. Note: The extra “Domain Privacy Protection” is not necessary. Select “no thanks” to go without and save $9.99/yr. Optional: Select the Data Center (East or West) you are physically nearest to. Once you’ve secured the best domain name for your blog, it’s time to finish filling out your order form. InMotion’s form is simple to complete and secure. Don’t forget to choose “Install WordPress” from the Auto-Installer. Congratulations You Installed Your Blog Platform On A Domain You Own! Watch this quick video to see how easy it is to setup your blog! What You’ve Done – You’ve now setup your host account, registered your own domain name and installed your new blogging platform! I told you it was gonna be this easy! What’s Next? – Now all you need to do is check your email! Don’t see these emails? Make sure you’re logged in to the email account you used during registration, check your spam folder, or wait a few extra minutes. The last one is the most important, as it contains the information you need to log into your blog software. 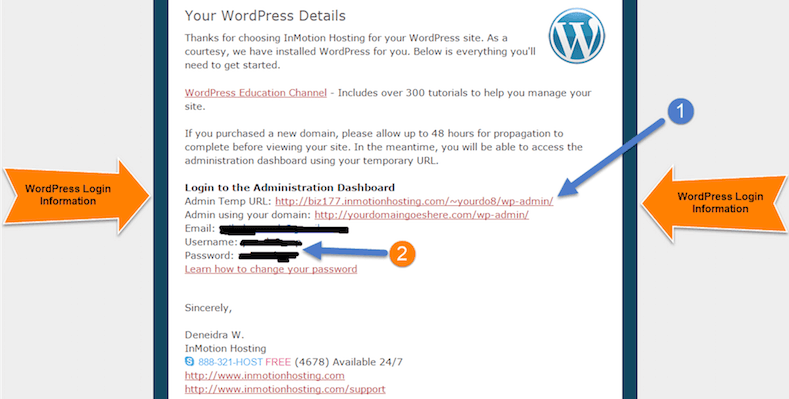 Click on the “Admin using your domain” (if your blog platform is not ready yet then click on the “Admin Temp URL” link). 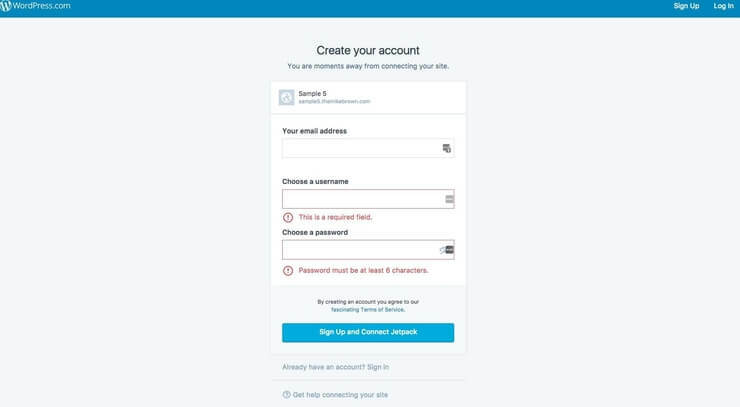 Go back to the Welcome Email and Copy your Username and Password then jump back over to your Admin login page and paste in the appropriate information. Congratulations! You’ve just started your very own blog! Feels great, doesn’t it? But what now? Learning a few basics will be helpful (But don’t worry the material below is just meant to get you familiar with your new blog platform, the real learning will be done in the Blog Academy with high-quality video tutorials). You can access your dashboard and manage your website anytime by typing in your domain name plus “/wp-admin” (without the ” “) into your web browser’s (chrome, safari, firefox, etc..) address bar. For instance, if I want to access my Dashboard the “Admin” area of my blog, I would type into the address bar at the top of my browser thebloggingbuddha.com/wp-admin and hit enter. “CMS Core” Put simply, this is the WordPress operating system that we just installed. Now that it’s installed, you have full access and you’re ready to start blogging! “Dashboard” WPAdministrators get their own interface to manage everything that happens on their site. Every time you sign-in you’ll be greeted by a very helpful page called the Dashboard. The Dashboard provides an easy way to see a high-level view of everything that’s happening on your website. “Posts” This is where you’ll create new posts to publish on your blog. To start your first post, simply click “Posts” on the sidebar and then click “Add New”. You’ll see that there is already a post titled “Hello world!”. This is a default post that appears on every new blog; you can go ahead and delete it (click “Trash” under the post). “Pages” This is where you can create new pages for your site, such as an “About Me” or “FAQ” page. Setting > General: Change the name of your blog, site tagline and other settings here. “Appearance > Themes” You can alter the design of your blog here. 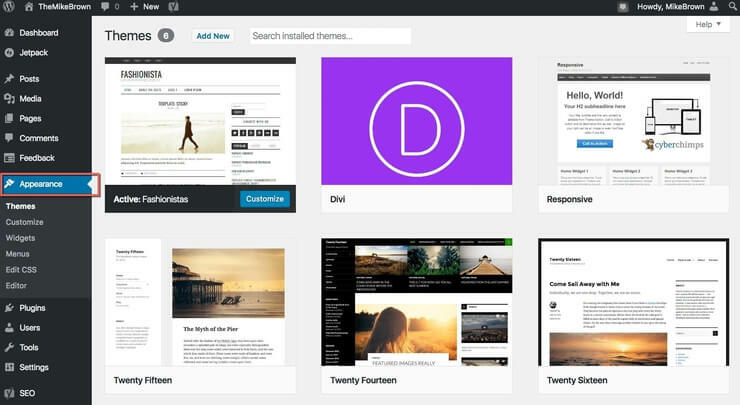 Search for free themes to install that are already loaded to the dashboard for your new site. 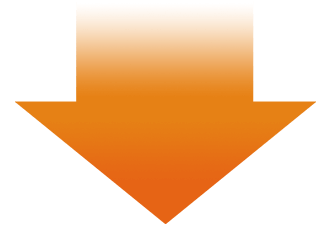 Alternatively, you can find a theme that you like from another website, download it, and upload it to your dashboard manually using the “Upload” button. “Plugins” These allow you to further customize your blog and make it engaging for your readers. You can get banner ad spaces, SEO helpers, contact forms, newsletter signups and TONS more. Click the “Add New” button to explore available options, or manually install a plugin from elsewhere. What is a theme? Simply put a theme provides all of the stylings for your website. Most themes provide the overall design and style for your site including the font style, colors palette, widget locations, page layout (or templates), and the style of your blog posts. There are over 4,000 professionally created themes that are fully customizable within the WordPress Theme Directory all for free- so you have plenty design choices. Want to know how to make a blog theme change? In the Main Navigation area on the right scroll over “Appearance” and select “Themes” from the available options. Your blog platform installs a few themes by default during setup. To add more theme options to your Dashboard select “Add New” on the top left. There are several methods provided to search for new themes at the top of the Dashboard. I recommend taking a look at all of the options available. Once you find a theme, you like you can either Preview or Install it. After Previewing a few different themes, Install the theme you like best. Now select Themes again from the Navigation Menu on the left. You should see the theme you installed, and you can now Activate your new theme. Congratulations you just installed your first theme! What is a plugin? A plugin allows you to extend and expand the functionality of your blog. The core of your blog platform is designed to be lean and lightweight, the ability to add plugins allows you to maximize the flexibility of your website while minimizing code bloat. 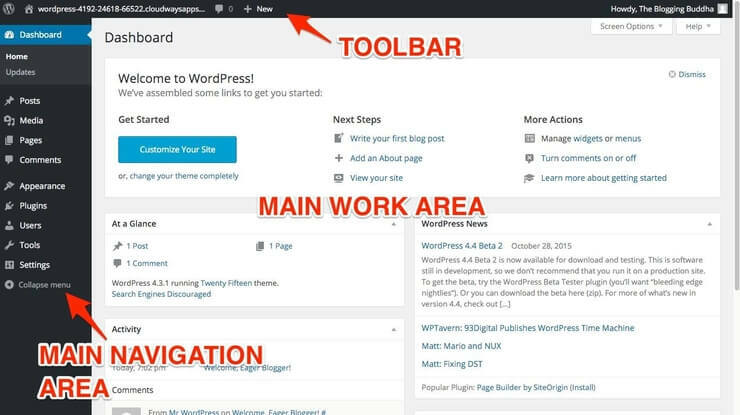 Follow along with the screenshots below to learn how to connect your self-hosted blog to WordPress.com via the JetPack plugin so you can take advantage of all the enhanced benefits and security. In the Main Navigation area on the right scroll over “Plugins” and select “Add New” from the available options. 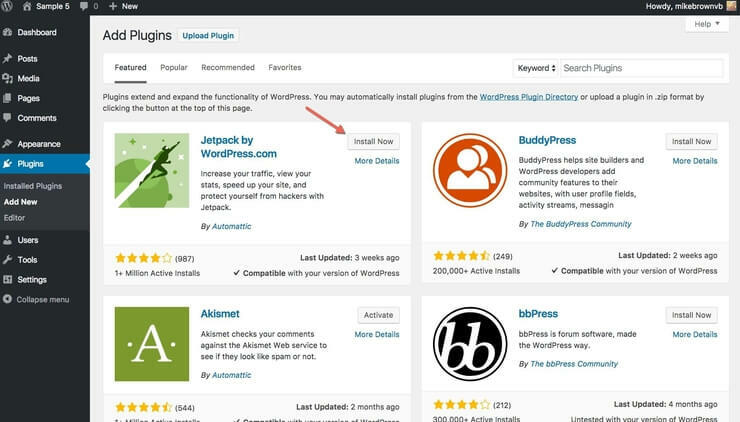 JetPack by WordPress.com is always the first plugin to appear. Hover over the “Install Now” button and click. Once the plugin is installed the “Install Now” button will turn blue and read “Activate”. 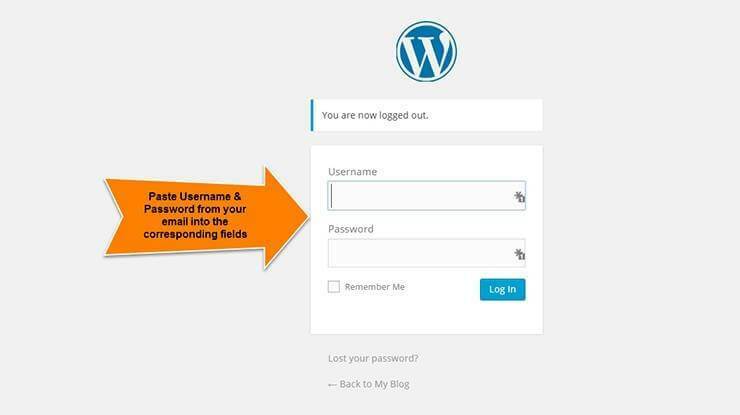 Fill in your email address, create a username, and password for your WordPress.com account and click “Sign Up and Connect JetPack”. There are three plans to choose from. All we need is the Free plan so select the Free plan from the choice available. You will have immediate access to your site stats right inside your dashboard. You will also get additional tools to help with traffic growth, site management, security and content creation. To install the Yoast SEO plugin just scroll over “Plugins” and select “Add New”. In the top right corner type in “Yoast SEO” in the search bar and hit enter, select “Install Now” then Activate. You can visit Yoast.com to learn more about how to configure their plugin. Creating a blog that is well optimized for search engines is very easy using the Yoast SEO plugin. Congratulations! You’ve just learned how to build a blog and install the two most critical plugins for any new blogger. If you enjoyed this quick walkthrough and really want to learn how to use your new blog software to build a custom website, then head over to the Blog Creators & Marketing Academy where I provide high-quality video lessons on how to build the website of your dreams. Want to skip all the reading and jump right into video lessons to start blogging? All the material in the free email course is delivered in an eLearning format that’s fun and engaging — aimed at ensuring you are equipped with all the tools and knowledge necessary to create a successful blog. From installing your blogging software to showing you how to build full blown websites, the Academy has you covered! P.S. One more thing before you go: If you feel like this tutorial helped you understand how to start a blog, I’d love if you shared it with your friends and family. Do you want to know more about how to start a blog before you get started? Do you need help coming up with ideas to start blogging about? Do you want to know more about WordPress and why it is the best blogging platform? WordPress vs. Blogger: What’s The Difference? Do you want to learn how to drive more traffic to your blog right now? Do you want to learn how to make money from your blog? Interested in learning how to optimize your blog for maximum profit? Just like that, your very own blog is now up and running! But now, here comes the most exciting part: Learning how to build a website you’ve always envisioned. This is the reason you’ve been drawn to blogging, this step right here. Bringing to life the ideas and inspirations that have been floating around your brain for weeks, months or even years. In the Blog Creators & Marketing Academy: 6-Day Email Mini Course, I’m going to show you exactly how to bring together all of the amazing tools at your disposal to create your vision using high-quality video courses. Are you from Canada and need hosting? You'll find our best web hosting Canada guide extremely helpful. Please Note: To participate in the Academy, you must have already completed this tutorial and have your blogging platform installed. Do you still need to get your blog platform installed? To learn more about the top WordPress hosting providers take a look at my Best WordPress Hosting page or just head over to the Blog Academy! I'm a writer and part-time blogger. I help people build profitable blogs while working a full-time job, and I'll show you how to do it too. FREE 6-Day Mini-Course: How to Build Your First Profitable Website and Set Your Blog Up for Success From The Start! No Design Skills Needed - Learn to design your blog like a professional. Learn The Exact Framework - That the internet's top bloggers use to drive tons of traffic. One-On-One Support - Via email you can ask unlimited questions & get direct answers. 20-Part Blogging 101 Video Series - Teaching you how to use WordPress (your blog platform) to build your site!